Welcome to the digital portfolio of Ted Balmer. Children’s books, textbooks, and more. I’ve written and illustrated a Christmas themed children’s book that’s available on a number of digital reading platforms. I am currently in the process of writing another children’s book as well as a graphic novel. Also, I designed and created hundreds of illustrations for two award winning college level engineering textbooks, as well as their followup editions, of which have sold over 60,000 copies. World class web design and programming. I’ve been designing websites since the late 90s based on the LAMP stack and WordPress. In that time, I created my own Content Management System from scratch, a one-of-a-kind web application for generating record sheets for the popular board game Battletech, and as well as a number of websites for various organizations, individuals, and businesses. Photography from around the globe. Since the advent of the digital camera, and the simplicity surrounding it, my interest in photography ballooned. Since then, I have taken photos from Wisconsin to Switzerland, and quite a few places in between. My specialty is nature and architecture, using either my iPhone or Canon dSLR. Everything from Pencil to 3D. Since as far back as I can remember, I had some interest in art and drawing. Towards the middle of the 90s, I became fascinated with computer 3D modeling and since that time I created around a hundred 3D rendered scenes of varying subjects. A few of these models even ended up on a 3D printer. In the end, all of this culminated in the illustrations I created for Mistletoe’s Night. These days, I’ve gone back to my roots and focused my attention on more traditional 2D digital art, which I intend to make good use of with my future books and works. Making pictures move for over a decade. I began working with 3D animation during the late nineties, utilizing 3ds max and then later Blender. 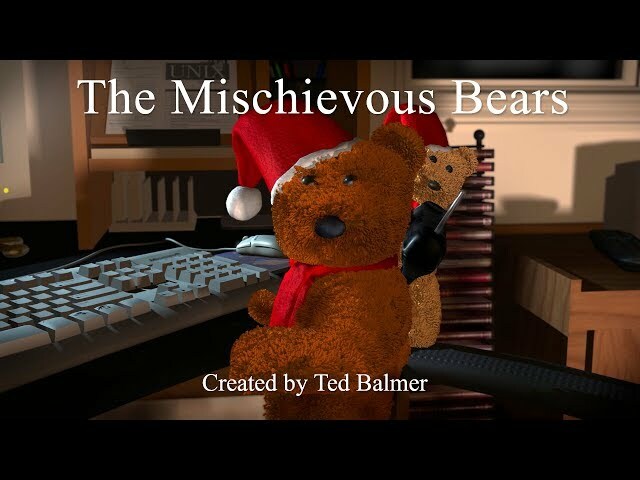 My earliest movies were pretty crude, however I kept plugging away and managed to create a short movie called The Mischievous Bears. Since then, I’ve made a couple of 3D walk-throughs as well as some straight video editing. I’ve also created a few time-lapse animations of my paintings.